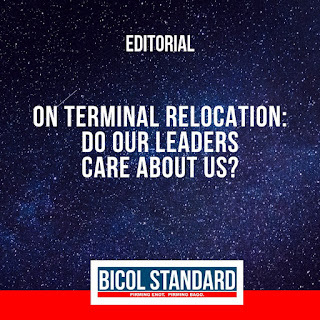 Home Editorial Opinion EDITORIAL | On terminal relocation: Do our leaders care about us? EDITORIAL | On terminal relocation: Do our leaders care about us? The relocation of the bus terminals to the outskirts of the metro to reduce traffic congestion is a ludicrous solution to the problem. For those who haven’t been following the news: the bus terminals would be relocated to Sta. Rosa, Laguna and Valenzuela City allegedly in an effort to reduce traffic in the metro. From Sta. Rosa, Laguna, commuters from the south would have to alight—bleary-eyed and exhausted and carrying their heavy luggage at around 3 a.m.—and board city buses that would transport them to their destination. It takes almost no cerebral effort to see why this is a preposterous solution, as it essentially solves nothing. If anything, it creates more traffic as city buses would still need to take the passengers to where they need to go. It may also mean added transportation costs from the city bus terminals to their destination, as presumably the city buses would not take the passengers to their doorstep. Lamentably, the relocation comes at a time when Bicol’s so-called eaders are busy with their political campaigns. This would have been a good opportunity for the incumbent leaders and aspirants alike to prove that they truly care about the welfare of the constituents. However, for reasons we cannot fathom, absolutely no one seems to be bothering to point out absurdity of the solution to the EDSA traffic. It may not be too late, as the total closure will still happen in June, following the dry run this month, the signing of the regulation by the Metro Manila mayors, and the publication before implementation. But unless someone dares to speak for us, we will remain voiceless, insignificant, and hardly the oragon people we always claim to be.